As I was self-taught, so to speak, the recordings I made were of variable quality, sometimes ‘improved’ by the use of free software like Audacity and Raven Lite. They have, however, rekindled my interest in bird calls and song to a degree I haven’t had since my youth! Having accumulated a number of recordings, what to do with them? So I have added some of my very amateur recordings to this site in the hope that they may be of interest and use to other birders. Others will be added in future. They may well be amateur but I derived great satisfaction from getting them! All are in MP3 format so should play ok. I would be interested in any comments via my email address on the Latest page. In November 2008 I was lucky enough to be involved in the finding of a Hume’s Warbler at St. Mary’s Island, Northumberland which remained in one small patch of bushes for several days. Also present at the same time and in the same bushes was a Yellow-browed Warbler. Both birds regularly called which caused some confusion among birders about which bird they were seeing and hearing at any one time! This prompted me to impulse-buy a Remembird recorder and I managed to get a very basic sound recording of the Hume’s Warbler on its last day! You can hear that first recording here - complete with background cars, children shouting and birders talking! From then on I was hooked and started pointing the Remembird at everything (well birds) that uttered a sound. I added a Yoga condenser microphone and then a Hama RMZ-10 mic to help with my efforts which served me well for a couple of years. 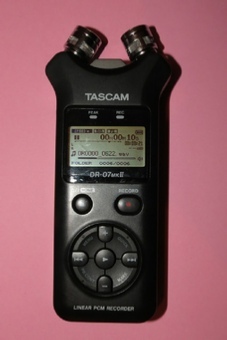 In 2011 I took the plunge and purchased a Tascam DR-07 Mk II digital recorder.